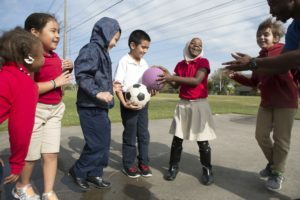 This fun version of basketball keeps the game moving, promotes teamwork, and provides tons of opportunities for new students to step in and play. Have one basketball, three cones, one basketball hoop and marked boundaries. Explain the rules of the game and the basic rules of basketball—including proper dribbling, passing, shooting, and defense. Place three cones at the top of half a basketball court. The first player in each line steps forward past the cone and turns and faces the next player in line. The three people that have stepped out are a team of three and will play defense. They will play in a half-court game against the next players in line behind each cone, who form another team of three. The defenders get ready as the first offensive player, behind the middle cone, starts with the ball. This player passes the ball to one of her/his teammates to start the game. If a player shoots and misses, either team can rebound the ball and shoot again immediately. When a point is scored the team that made the basket stays on the court to play the next three people in line. The team that scored starts on defense. If a foul is called, the player who has been fouled gets to throw the ball in from out of bounds. The last player holding the ball takes a free throw shot. If the player makes the shot, their team stays on the court. If the player misses, their team returns to the end of the line, and the other team stays on the court. If a team wins three times in a row, they have earned three claps and return to the end of the line. Players cannot dribble; in order to move the ball, they must pass. When players on defense rebound the ball, they must pass it one time before they can shoot the ball.